Motley crew! Ron shows a bit of leg, and the chair shows a bumper sticker we found in Idaho. Once again the Captain of Industry, Fred Mork pulled a team together for the 2014 Velocette Owners’ Club annual rally. This year the travellers included me, Jeff, Ron and Jeanne the babysitter. No, she wasn’t hired to watch us, but she sure helped out! The bikes included my Buell, 3 Velocettes, a BSA, a Triumph and Mork’s Matchless. The route was straight-forward north and east, 80 to 93 to Salmon, Idaho. When did Nevada get so big? Reno flew by, but after that time slowed down and the universe expanded. 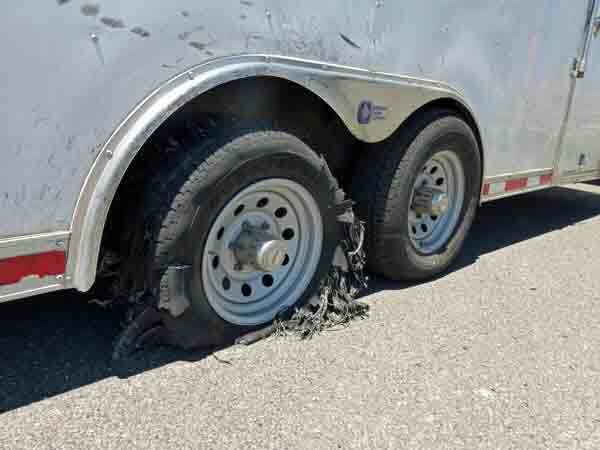 Somewhere just past Lovelock, we had a flat tire. It wouldn’t be a road trip with Mork is incomplete if he doesn’t get a chance show off how efficient he is with tire changes. Fourth of July fireworks filled the sky as we drove into Twin Falls. Obviously the explosives are not banned here. 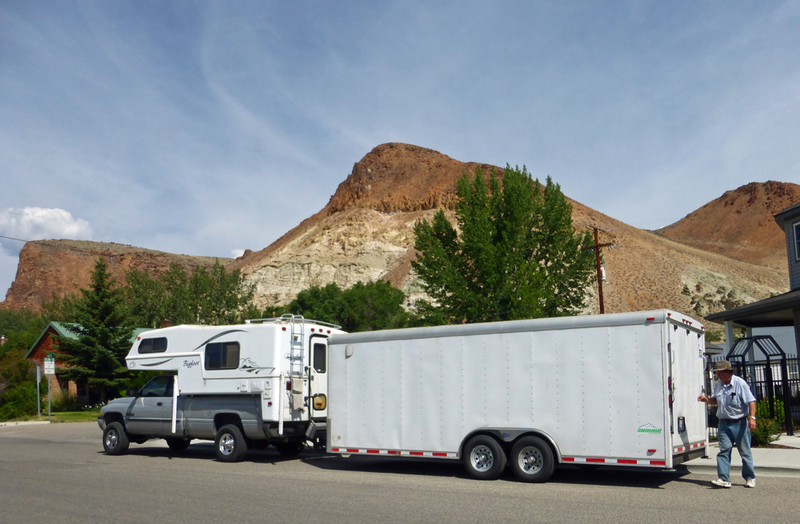 We camped in Twin Falls and in the morning got two new tires. Yes, two. A second was ready to blow. We drove without incident to Century 2 Campground in Salmon, Idaho. Dinner was at the Junkyard, reputably the best food in Salmon. 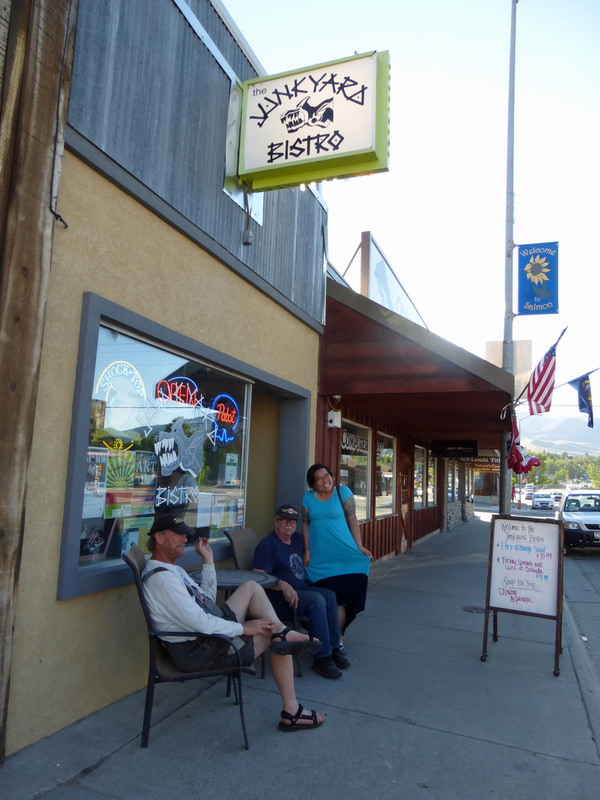 Don’t be scared of the name or front – the food at the Junkyard Bistro was good! See the smiles on happy diners. 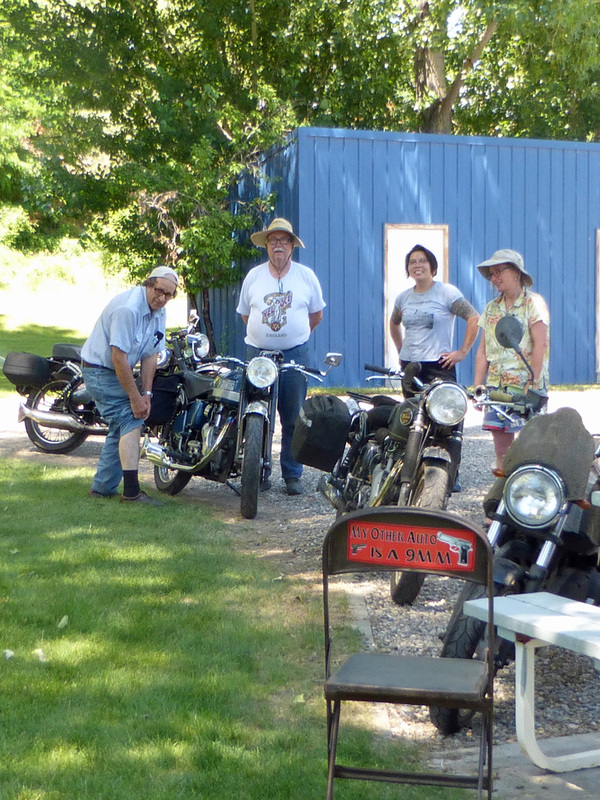 This entry was posted in Uncategorized and tagged Fred Mork, Idaho, Lanora Cox, motorcycle rides, Salmon, Velocette, vintage motorcycles, VOCNA. Bookmark the permalink. Nevada is huge! and not in a good way.